Famous TURKISH CUISINE... What popular dish to eat in Turkey? If you found this website useful and believe that you know others who may also enjoy this, please pass the word on.
' S i m i t '(Sesame seed ring) offered by street vendors almost everywhere in Turkey. - - - - - - - - - - - - - Food fit for a Sultan! Travelers from all over the world are discovering Turkey(Turkiye) and Turkish food. Turkey is blessed with varied climate which allows the country to get almost everything on its land. Turkey is one of the few countries in the world that has been self sustaining, producing all its own food. Turkish cuisine has many specialties and variations. For example there are at least forty ways to prepare eggplant alone. Lamb was the basic meat of the Turkish kitchen, but not anymore... because lamb is very expensive meat now. In Turkey traditional dinner starts always with soup. Turkey has a lot of sea fish. Turks don't eat pork because of their religion. Mutton, beef, lamb, fish, and poultry are typically served grilled or roasted. The real beauty of Turkish cooking is its affordability, use of fresh ingredients, and ease of basic cooking techniques. Dishes are simply presented, not hidden under sauces, or excessive presentations. In Turkish cuisine the DOLMAs are famous('dolma' in singular, 'dolmalar' in plural). The word DOLMA comes from the Turkish word 'dolmak' which means 'to be filled' or 'to be stuffed'. The vegetables used for dolmas are almost unlimited. The best known DOLMA is 'Stuffed grape leaves' (called 'YAPRAK DOLMASI' in Turkish). One can use any vegetable that can be stuffed. Generally, the following vegetables are often used in DOLMAs: Tomatoes, bell peppers, zucchinis, cabbage leaves and eggplants. Various regions in Turkey make dolma in different ways such as using nuts and raisins in the dolma stuffing. When dolmas are made with olive oil and without meat, it is eaten cold and when dolmas are made using butter or vegetable oil and meat, it is served warm. Garlic flawored yogurt souce always served with meat stuffed dolmas. Until recently, olive oil was number one ingredient in traditional Turkish kitchen but, because of economical difficulties in almost every family budget, olive oil price increase redirected Turks to consume vegetable oil. Some restaurants and families use olive oil for salads only. Or when they cook, they blend the olive oil with regular cooking oil. 'Kabob' means any kind of grilled meat or/and meat together with vegitables in Turkish. Turks prepares a lot of different kabobs in every region of the country. 'Kabob' in Turkish is KEBAP. Kabobs are known worldwide and available everywhere in Turkey.... although their primary ingredient was lamb, but not anymore. Now in most restaurants and homes lamb has been replaced with beef and poultry. Some restaurants uses a combination of mutton and beef together. Other kabobs are made with chicken or fish and always grilled together with vegetables on a skewer. such as bellpeppers, tomatoes, onions and eggplant pieces on a skewer. In Turkish 'Shish' means 'the skewer'. DONER KABOB (in Turkish: Doner Kebap) another famous Turkish dish (as called in some parts of the world 'Chawarme' or/and 'Gyro'), being a roll of meat on a vertical skewer turning parallel to a hot grill and sliced to serve. Meat traditionally was lamb but today it is mostly combination of beef and lamb. Döner kebab is not famous only in Turkey, it is very famous in Europe too, especially in U.K.
KOFTE is kind of kabob(called IZGARA KOFTE in Turkish) that made with ground meat (conbination of beef and lamb or only beef) in shape of small individual flat or cylindrical meatballs or shaped along around the skewer as a whole piece. 'Kofte' meat is prepared with several spices like; parsley, garlic, plus a small amount of egg and dry ground bread (just inside of the bread, but no crust). Kofte can be cooked on grill and/or in frying pan. Kofte usually served with rice and salad, especially with PIYAZ salad, which is made with white navy beans, onion, olive oil, sliced hard ball egg and winegar. There are many different kinds of KOFTEs serves in Turkey... depent which part of the country are you and in which restaurant you are. 'Izgara kofte' is the kind of that prepared on the grill and in our opinion it is the best one! 'Kadin budu kofte', 'Cig Kofte', 'Islama kofte', 'Inegol kofte' are variety of koftes. Another famous kabob is BURSA's ISKENDER KABOB which is sliced 'Doner kabob' served in tomato sauce, hot butter and delicious Turkish yogurt on diced pide (Turkish flat bread). One other very-very famous kabob dish is TANDIR KABOB (called 'Tandir Kebap' in Turkish) which is lamb pieces(sometimes whole lamb) cooked in a pit. This a typical Anatolian dish. 'Tandir Kabob' can be found not everywhere but in certain specialty restaurants in today's Turkey. Mixed grilled meat (called KARISIK IZGARA in Turkish), usually combines tender chicken breast, beef, lamb chop and kofte patties. All these mostly served with rice pilaf and sometimes together with french frys and cold-cut vegetables pieces. 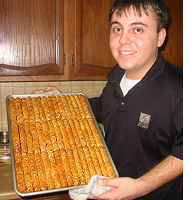 BOREK are pieces or whole tray of baked goods stuffed with either cheese, spinach and/or in conbination of meat. Thin sheets of dough layered or folded into various shapes before being filled with with items above and baked or fried. Turkish dessert such as BAKLAVA and KADAYIF are the most popular. These are followed by milky deserts of SUTLAÇ, MUHALLEBI, KAZANDIBI. HELVA, ASURE and HOSAF are other countable delicious deserts. Everywhere in Turkey easily you can find eateries where BAKLAVA, variety of BÖREKs, and all milky deserts are served, exclusively or in combination. These are excellent places to eat breakfast or lunch at any time of the day. Turkish tea 'CAY' prepared in a special way, by brewing it over boiling water with a pot called 'Caydanlik' and served in delicate, tullip shape small clear glasses(no handle) to show it's deep red color and to drink it hot as possible. Turkish coffee(KAHVE) mostly drink by the adult person... this mean, almost not seen drink by kids! Also Turkish coffee is not used as a drink for breakfast or any other regular meal. Baked goods and bread are excellent all over Turkey. Bread is the main and most consumed product in Turkey and eaten with every meal. Many Turks even eat bread with pasta and rice. Turks mostly eat loaf type of bread called EKMEK, almost like French 'Baguette'... the different is, it is not so thin like Baguette. We repeat; Turks are good or maybe even over bread eater nation. In Turkey in very neighborhood has a bread-bakery called 'FIRIN' that produces golden crisp loaves twice a day, morning and afternoon. These bakeries fills the streets with their irresistible and wholesome aromas. During the holy month of Ramadan (Ramazan) a flat bread called 'PIDE' becomes available in all bread-bakeries FIRIN. Families eat this bread with their meals after fasting during the day. Turkish style pita bread is not the pocket bread that is known in US as 'Arabic' or 'Pita' bread. It is a flat bread that looks like a hand shaped quilt and is always eaten fresh from the baker's oven. PIDE is hand made and served always in the restaurants which serve with variety of kabobs. they love to read the future, through shapes that coffee powder itself forms, at the bottom of the cup called FINCAN. After finish your coffee, you just need to turn your cup up side down and wait for a while... until its cool down and ask for an expert to read your future. Mostly oldest ladies does know to read coffee. Other additional item for a good weekend breakfast can be sliced PASTIRMA or SUCUK cooked in butter with scrambled or over-easy eggs. PASTIRMA, a term which literally means -being pressed- and which is higly seasoned, air-dried cured beef. SUCUK (sou-jouk) is spicey Turkish sausage. It consists of ground meat, with various spices including cumin, garlic, salt, and red pepper.